Platelets are enucleated cytoplasmic fragments of bone marrow megakaryocytes with a limited capacity for protein synthesis. Although lacking DNA, platelets do contain megakarocyte mRNA along with components necessary for protein synthesis,1 and are capable of performing nuclear functions such as pre-RNA splicing.2 Once in the bloodstream, platelets have a lifespan of 7–10 days. The primary function of platelets is to stop haemorrhage from sites of vascular injury. This is accomplished through the key platelet functional processes of adhesion, activation, cross-linking or aggregation, with the involvement of several important proactivation mediators. Platelet adhesion is initiated by tethering of circulating platelets to an area of vascular injury. Usually, the intact endothelium prevents unwanted platelet activation by acting as a physical barrier to underlying thrombogenic substances (such as collagen, tissue factor and von Willebrand factor) and by releasing mediators that inhibit platelet activation (Figure 11.1). This involves three separate pathways, (1) the arachadonic acidprostacyclin pathway, (2) the L-argininenitric oxide pathway and (3) the endothelial ecto-adenosine diphosphatase (ecto-ADPase) pathway. Endothelial cyclooxygenase 1 & 2 (COX-1 & 2) convert arachadonic acid to prostacyclin metabolites (such as prostaglandin I2 (PGI2)) which elevate platelet intracellular cAMP levels and inhibit platelet activation in a process thought to be mediated by protein kinase A. 4,5 Nitric oxide, produced by endothelial cells, passively diffuses into platelets causing an increase in cytosolic cyclic guanine monophosphate (cGMP) levels and activation of cGMP dependant protein kinases with a consequent reduction in intracellular calcium. Ecto-ADPase is a protein constituent of the endothelial cell surface, which upon activation, limits the recruitment phase of platelet reactivity by reducing plasma concentrations of nucleotides, particularly ADP. 7 Endothelial cells with impairment of the above processes are termed dysfunctional, and express an ‘atherogenic’ profile of receptors such as P-selectin, E-selectin, ICAM-1 and VCAM-1 (as seen in Figure 11.1), as do endothelial cells which have been activated by exposure to various mediators (such as thrombin, TNF-? and LPS), sepsis, trauma, rapid temperature variations, shear stress and minor alterations to the local microenvironment. These features usually also accompany acute vessel injury. However, in the absence of acute injury, an activated or dysfunctional endothelium may result from prolonged exposure to high blood pressure, shear stresses and dyslipidaemia, and consequently result in pathological platelet activation and inflammatory cell recruitment.10 Platelet adhesion begins by the exposure of circulating platelets to an activated or dysfunctional endothelium, or to exposed subendothelial matrix proteins such as collagen, fibrinogen and von Willebrand factor following endothelial injury. These ligands are capable of binding to receptors on inactivated platelets at high shear rates and tethering them to the site of vascular injury. Collagen binds to glycoprotein VI (GPVI), whilst von Willebrand factor binds to the platelet receptor GPIb-IX-V. In addition, collagen also binds von Willebrand factor, which is a mechanism of facilitating the adhesion of other inactivated platlelets. P selectin on the surface of activated endothelial cells, also binds to GP1b? and PSGL-1 on the platelet surface, facilitating tethering and rolling. Platelet adhesion triggers the process of platelet activation, culminating in the activation of the GPIIb/IIIa receptor, enabling it to bind soluble fibrinogen and von Willebrand factor allowing firm adhesion of the platelet to the endothelium via fibrinogen bound to receptors on the endothelial surface (?v?3 and ICAM-1). Figure 11.1 illustrates how a tethered platelet becomes activated and firmly adherent via fibrinogen bound surface receptors. GPIIb/IIIa (?IIb?3, CD41/CD61) is a member of the superfamily of ‘integrin’ type receptors, which are transmembrane proteins comprising of various combinations of non-covalently bonded subtypes of ? and ? subunits. Integrins are involved in intracellular and extracellular signal transduction (in both directions) as well as the mechanical coupling of cytoskeleton proteins to either the extracellular matrix or surface receptors on other cells. Mechanisms of platelet adhesion to dysfunctional endothelium. Normal endothelial cells inhibit platelet activation by three primary pathways as shown. Endothelial cells activated by injury, sepsis or inflammation, or dysfunctional (for example, after exposure to prolonged hypertension), express an array of receptors that facilitate tethering of platelet to the vascular wall, removing it from the blood stream. These interactions, particularly with potent platelet stimulators such as collagen, promote activation of the platelet; enabling activated GPIIb/IIIa receptors to bind fibrinogen bound on the surface of endothelial cells by receptors such as ?v?3 and ICAM-1. Platelet-adhesion is also mediated by interactions between platelet integrin receptors and exposed sub-endothelial matrix proteins such as collagen and von Willebrand factor. These mechanisms result in firm adhesion of the activated platelet to the vessel wall. In contrast to the relatively passive process of platelet adhesion, platelet activation is a metabolically active process involving several important and generally irreversible, biochemical and physical alterations to the platelet. These processes include the release of preformed mediators, alteration to the surface receptor profile and cytoskeletal changes resulting in a dramatic physical change to the platelet structure. These changes serve to facilitate the incorporation of the activated platelet into a developing platelet thrombus, activate neighbouring platelets via positive feedback mechanisms whilst also playing a key a role in the recruitment of inflammatory cells and the propagation of a broader inflammatory response. Various non-chemical stimuli can activate platelets. These include hypothermia, trauma and alterations to acid-base balance. Nonetheless, endogenous molecules mediate the vast majority of platelet activation in both the physiological and pathological setting, acting via both autocrine and paracrine mechanisms. The most important of these are collagen, thrombin, adenosine diphosphate, adrenaline and thromboxane A2. ‘Outside-in signaling’ refers to the process of mediators binding to specific receptors on the platelet surface and initiating a secondary messenger response inside the platelet. These processes are mediated via several secondary messenger pathways namely: the phospholipase C and PI-3 kinase pathway, the eicosanoid and arachidonate pathway, protein kinase C and the cAMP and cGMP pathways.15 ‘Inside out signaling’ refers to intracellular pathways mediating functional changes to surface receptors, such as the GPIIb/IIIa receptor (as discussed below). Collagen and thrombin are the most potent platelet stimulators. Collagen binds directly to GPVI and the integrin ?2 ?1 (also known as GPIa/IIa) and is crucial in the initial tethering of platelets to sites of vascular injury. Other integrin receptors bind collagen bound to von Willebrand factor. Collagen types I, III and VI are the most common type of collagen in the blood vessel subendothelial matrix and they bind directly to GPVI (see Figures 11.1 and 11.3). After binding, a series of intracellular signaling processes result in protein phosphorylation and consequently platelet activation.16 Thrombin is generated at sites of vascular injury from its precursor prothrombin, by virtue of the intrinsic, tissue factordriven pathway of the coagulation cascade. Thrombin binds to G-protein linked protease activated receptors (known as PARs) on the platelet surface. Human platelets express two distinct PAR receptors, PAR1 and PAR4. PAR1 is coupled to G?12/13, G?q and G?i proteins, which mediate cytoskeletal responses, increased intracellular calcium and reduced cAMP respectively, each of which are crucial steps in platelet activation (Figure 11.2). PAR1 appears to be a more potent activator of platelets than PAR4 and has been proposed as a potential target for therapeutic inhibition (atopaxar – see Figure 11.3). Effective inhibition of PAR1 and PAR4 leads to near complete inhibition of platelet activation, even in the presence of high concentrations of thrombin. ADP is generated and stored in platelets and red blood cells in dense granules. Platelet activation results in the release of stored ADP granules and activation of nearby platelets – a key amplifying process (Figures 11.2 & 11.3). Several receptors, known as P2 receptors interact with ADP resulting in platelet activation. Present on platelets are the P2X2, P2Y1 and P2Y12 receptors. P2X2 is an intrinsic ion channel, which upon ligand binding allows calcium influx into the platelet, promoting activation.18 P2Y1 is a G-protein coupled seven transmembrane domain receptor which activates protein phospholipase C causing release of stored intracellular calcium and facilitating conformational change of the platelet. P2Y12 is similarly a G-protein coupled receptor that, upon activation, mediates a reduction in intracellular cAMP (Figure 11.2). Of these receptors, P2Y12 plays the more significant role in amplifying and sustaining the platelet activation process. Platelet function studies have demonstrated that simultaneous activation of both P2Y1 and P2Y12 receptors is needed for the full platelet response to ADP. Both these features have made inhibition of P2Y12 with clopidogrel a very effective therapeutic target. Thromboxane A2 is synthesized from arachadonic acid in activated platelets via the cyclooxygenase pathway. It freely diffuses across the platelet membrane to activate neighbouring platelets. Thromboxane A2 binds to T? or T? receptors, which are in turn coupled to G-proteins G?q, G?12 or G?13 – each of which activate phospholipase C – an enzyme which degrades membrane phosphoinositides creating key second messengers inositol triphosphate (IP3) and diacylglycerol (DAG) which facilitate protein kinase C mediated intracellular protein phosphorylation and raised intracellular calcium respectively (Figures 11.2 and 11.3). The G-protein linked receptors aid in amplification of the response to ligand binding as a single receptor may interact with multiple G-proteins. Adrenaline is the least potent physiological stimulator of platelet activation. Surface ?2 adrenergic receptors are G-protein linked receptors which are potent inhibitors of cAMP formation, although studies suggest supra-physiological doses are required for activation of platelets by adrenaline alone.21 Nonetheless, circulating adrenaline release by a stress response, may serve to reduce overall platelet activation threshold, making platelets more susceptible to lower doses of other platelet activating mediators. Platelet-activating ligands bind to G-protein coupled receptors inducing intracellular second messenger pathways, which then mediate the biochemical and structural changes associated with platelet activation. G-proteins usually consist of ? and ?? subunits. The ? subunit exists in several isoforms, each mediating a specific intracellular function.22 The ?q and ?? subunits activate phospholipase C (both) and PI3K (??) in a manner discussed further below. The ?s and ?i subunits promote or inhibit intracellular cyclic AMP activity respectively – although the exact mechanism involved is as yet unclear. Increased intracellular cAMP activity is associated with inhibition of platelet activation, a process utilized by the anti-platelet agent dypridimole. The ?12 subunit is involved in mediation of shape change by promoting cytoskeletal reorganization (as discussed further below).23 Figure 11.2 provides a broad outline of the key intracellular second messenger systems involved in platelet activation by several key receptors. There are two central intracellular pathways involved in platelet activation – the phosphoinositide hydrolysis pathway and the eicosanoid synthesis pathway. The former is a consequence of the activation of phospholipase C beta (via G alpha-q subunit of G-protein linked receptor proteins) and the activation of phosphoinositol 3-kinase gamma (via G beta-gamma). Once activated phospholipase C hydrolyzes PI-4,5-P(2) (PIP2) to DAG and IP(3). DAG in turn binds to and activates protein kinase C, causing phosphorylation of key enzymes known as protein kinase C iso-enzymes. IP(3) binds to receptors within the intracellular tubular system, resulting the release of sequestered intracellular calcium. The eicosanoid pathway results in the formation of thromboxane A2 . Platelet activation results in the release of arachidonate from membrane phospholipids by the action phospholipase A2 , which is stimulated by raised intracellular calcium. Arachidonate is then metabolized to thromboxane A2 by the action of cyclooxygenase-1 (COX-1), by a process inhibited by aspirin. 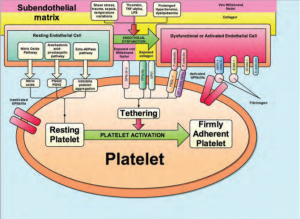 Platelet activation involves four primary features: (1) An important conformational change of the GPIIb/IIIa integrin receptor, allowing it to bind fibrinogen and von Willebrand factor, promoting platelet aggregation and the formation of a platelet thrombus. (2) The release of preformed intracellular granules of ADP and thromboxane A2 promotes further platelet activation and a local positive feedback of the activation process. (3) Activation results in a conformational change in the platelet itself, by rearrangement of the internal cytoskeletal ultra-structure. (4) It is increasingly recognized that platelet activation augments an inflammatory response by the surface expression of receptors, the recruitment of inflammatory cells, and the release of proinflammatory mediators. These functions have an important physiological role in the engagement of repair processes following injury. Nonetheless, inappropriate activation of these processes are crucial elements in pathogenesis of atherosclerosis. The GPIIb/IIIa receptor is from the ?3 subgroup of the integrin receptor super-family. The receptor consists of two proteins each with a transmembrane domain. GPIIb consists of a heavy (105kD) and light (25kD) chain linked via a disulfide bond. GPIIIa consist of a single (95kD) chain.26 Once activated, the receptor recognizes RGD (arginine-glycineaspartic acid) and KQAGDV (glycineglutamine-alanine-glycine-aspartic acid-valine) peptide sequences present on fibrinogen (both sequences), von Willenbrand factor and fibronectin (RGD sequence) making each of these proteins ligands for the activated receptor – with fibrinogen being the most potent.27 As shown in Figure 11.3, one fibrinogen molecule can serve to crosslink platelets and augment platelet aggregation.25 GPIIb/IIIa receptors are found exclusively on platelets (with the exception of the platelet precursor, the megakaryocyte), with approximately 60-80,000 receptors per platelet comprising 2% of all protein present in the platelet. They have been utilized in the clinical setting as potent anti-platelet targets as discussed further below. Granule exocytosis is a key consequence of platelet activation, allowing platelet activation to be exponentially amplified and a local inflammatory response to ensue. Microscopically, platelets contain dense, alpha and lysosomal granules. Dense granules contain platelet agonists, which promote platelet activation such as ADP, ATP and serotonin. Alpha granules contain adhesion-promoting proteins including fibrinogen, fibronectin, vitronectin and von Willebrand factor. These mediate platelet aggregation. Lysosomal granules contain glycosidase and proteases, the role of which is unclear. SNARE complex proteins (soluble N-ethylmaleimide-sensitive factor attachment protein receptors) are thought to be the primary mechanism regulating the vesicle-membrane interactions. Granule exocytosis is thought to be modified by the presence of aspirin, explaining part of its anti-platelet action. Once activated, platelets undergo a dramatic physical shape change, losing their discoid shape and developing elongated projections of cytoplasm, called filopods, mediated by reorganization of the cytoskeletal ultra structure. This reorganization involves alterations to three primary components of the platelet cytoskeleton: the cytoplasmic actin network, the cytoskeletal rim and the marginal band. The membrane associated cytoplasmic actin network consists of both filamentous polymers and monomeric globular forms of actin, a 42kDa abundant cytoskeletal protein. Platelet activation results in an increase in the proportion of filamentous or F-actin, and reorganization of the actin network into longer actin filaments promoting conformational change. This process is mediated by phosphatidylinositol produced during platelet activation. F-actin filaments are anchored to the plasma membrane, via actin binding protein via the GPIb/IX complex.29 The cytoskeletal rim contains multiple components including actin, filamin, talin, vinculin, spectrin (also seen in red blood cells), and alpha actin along with multiple membrane glycoproteins. The interaction of filamin with actin is the key factor in preserving the discoid shape of the resting platelet. Disruption of this interaction occurs in the presence of rising cytosolic calcium concentration, resulting in a loss of tethering of the GPIb to the cytoskeletal ring, promoting conformational change. Shape change is also facilitated by contraction of the tubulin polymers of the marginal band, however the exact biomechanical significance of this is still yet to be determined.30 The net result of the above processes is the physical transformation of the platelet from a discoid to a flat, broadened and star-shaped conformation known as spreading – allowing efficient incorporation of the platelet into an evolving platelet thrombus.